A Bio-Hybrid Stingray Robot Powered by Rat Muscle « Adafruit Industries – Makers, hackers, artists, designers and engineers! Nature-inspired robotics is a hot field these days. We’ve reported on robots designed to mimic cockroaches, salamanders, cheetahs, sea snakes, among others. Basically, if it’s alive, somebody out there is trying to make a robot version. So a robot inspired by a stingray might sound like more of the same. Not so. 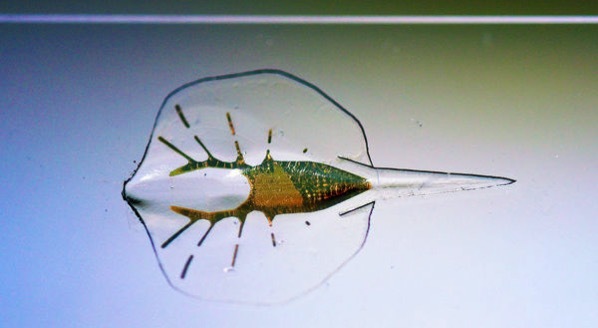 This tiny swimming robot, created by researchers at Harvard University’s Department of Bioengineering and Applied Sciences, is powered by rat muscle cells, making it a biohybrid machine–part robot, part biological tissue. Previous “bio-bot” projects have used biological actuators to produce movement. But the biorobotic stingray, developed by an international and interdisciplinary team of scientists, has pushed the field forward with a complex propulsion mechanism triggered by light, which allows the bio-bot to be steered around obstacles. And that’s just the beginning of what makes this robo-stingray special. It took him a year, but he eventually convinced Park to do it. “He’s my dream maker,” Parker says. Stingrays swim with a technique much admired by scientists and engineers alike. A few years back, we wrote about how the stingray’s movement was analyzed for the purpose of designing a better submersible. The secret to their swimming talent is their flat, round shape, the undulating movement of their pectoral fins, and a force they generate called the “leading-edge vortex,” the same force that gives birds their thrust. They started the construction of the robo-ray’s body with a layer of transparent elastic polymer–the aforementioned “breast implant.” Then they genetically encoded rat heart cells to respond to flashes of blue light, and aligned the cells along the ray’s “fins” in a serpentine pattern. These muscles would allow the fins to flex downward, but to ensure they would return to the starting position, the team reverse-engineered a stingray’s physiology to create a skeleton made of gold. Because, Parker says, “Cells like gold, just like people do.” A final layer of polymer, and the biohybrid stingray was complete. At just 16 millimeters long, and weighing just ten grams, the tiny robot looked a little like a transparent coin with a tail. They placed the tiny bio-bot into a saline solution filled with sugar to feed the rat cells and zapped it with pulses of blue light. The rat muscles contracted sequentially along the serpentine pattern, causing a ripple effect mimicking the swimming motion of a live stingray. And most importantly, it propelled the robot forward. By hitting it with asymmetric pulses, the researchers were able to steer it around obstacles.